) to distribute each writeset with row changes between members. This is done via binary logs and relay logs but before each transaction is pushed to binary/relay logs it has to be acknowledged by a majority of members of the clusters, in other words through consensus. This process is synchronous, unlike legacy replication. After a transaction is replicated we have a certification process to commit the transaction, and thus making it durable. This was a hands-on tutorial covering how to set up monitoring for MySQL database servers using the Percona Monitoring and Management (PMM) platform. PMM is an open-source collection of tools for managing and monitoring MySQL and MongoDB performance. It provides thorough time-based analysis for database servers to ensure that they work as efficiently as possible. ProxySQL is an open source proxy for MySQL that can provide HA and high performance with no changes in the application, using several built-in features and integration with clustering software. Those were only a few of the features we learned about in this hands-on tutorial. This tutorial guided us through the many considerations when deploying a sharded cluster. It covered the services that make up a sharded cluster, configuration recommendations for these services, shard key selection, use cases, and how data is managed within a sharded cluster. Maintaining a sharded cluster also has its challenges. We reviewed these challenges and how you can prevent them with proper design or ways to resolve them if they exist today. InnoDB is the most commonly used storage engine for MySQL and Percona Server for MySQL. It is the focus of most of the storage engine development by the MySQL and Percona Server for MySQL development teams. In this tutorial, we looked at the InnoDB architecture, including new feature developments for InnoDB in MySQL 5.7 and Percona Server for MySQL 5.7. Peter explained how to use InnoDB in a database environment to get the best application performance and provide specific advice on server configuration, schema design, application architecture and hardware choices. Peter updated this tutorial from previous versions to cover new MySQL 5.7 and Percona Server for MySQL 5.7 InnoDB features. Join us tomorrow for the first full day of the Percona Live Open Source Database Conference Europe 2017! In this blog, we’ll look at group replication and how it deals with flow control (FC) and replication lag. In the last few months, we had two main actors in the MySQL ecosystem: ProxySQL and Group-Replication (with the evolution to InnoDB Cluster). While I have extensively covered the first, my last serious work on Group Replication dates back to some lab version years past. Given that Oracle decided to declare it GA, and Percona’s decision to provide some level of Group Replication support, I decided it was time for me to take a look at it again. We’ve seen a lot of coverage already too many Group Replication topics. There are articles about Group Replication and performance, Group Replication and basic functionalities (or lack of it like automatic node provisioning), Group Replication and ProxySQL, and so on. But one question kept coming up over and over in my mind. If Group Replication and InnoDB Cluster have to work as an alternative to other (virtually) synchronous replication mechanisms, what changes do our customers need to consider if they want to move from one to the other? Solutions using Galera (like Percona XtraDB Cluster) must take into account a central concept: clusters are data-centric. What matters is the data and the data state. Both must be the same on each node at any given time (commit/apply). To guarantee this, Percona XtraDB Cluster (and other solutions) use a set of data validation and Flow Control processes that work to the ensure a consistent cluster data set on each node. The upshot of this principle is that an application can query ANY node in a Percona XtraDB Cluster and get the same data, or write to ANY node and know that the data is visible everywhere in the cluster at (virtually) the same time. Last but not least, inconsistent nodes should be excluded and either rebuild or fixed before rejoining the cluster. If you think about it, this is very useful. Guaranteeing consistency across nodes allows you to transparently split write/read operations, failover from one node to another with very few issues, and more. When I conceived of this blog on Group Replication (or InnoDB Cluster), I put myself in the customer shoes. I asked myself: “Aside from all the other things we know (see above), what is the real impact of moving from Percona XtraDB Cluster to Group Replication/InnoDB Cluster for my application? Since Group Replication still (basically) uses replication with binlogs and relaylog, is there also a Flow Control mechanism?” An alarm bell started to ring in my mind. I setup a simple set of servers using Group Replication with a very basic application performing writes on a single writer node, and (eventually) reads on the other nodes. You can find the schema definition here. Mainly I used the four tables from my windmills test suite — nothing special or specifically designed for Group Replication. I’ve used this test a lot for Percona XtraDB Cluster in the past, so was a perfect fit. Finally, I had to be sure I measured the lag in a way that allowed me to reference it consistently on all nodes. I think we can safely say that the incoming GTID (last_ Received_transaction_set from replication_connection_status) is definitely the last change applied to the master that the slave node knows about. More recent changes could have occurred, but network delay can prevent them from being “received.” The other point of reference is GTID_EXECUTED, which refers to the latest GTID processed on the node itself. The whole set of tests can be found here, with all the commands you need to run the application (you can find it here) and replicate the tests. I will focus on the results (otherwise this blog post would be far too long), but I invite you to see the details. Using the raw data from the tests (Excel spreadsheet available here), I was interested in identifying if and how the Writer is affected by the use of Group Replication and flow control. 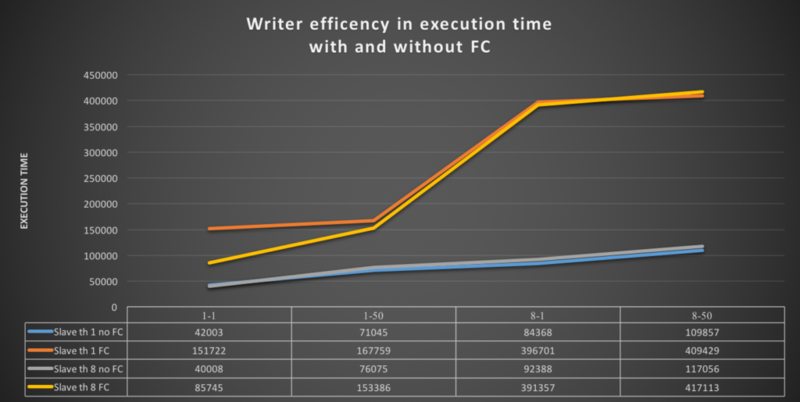 Reviewing the graph, we can see that the Writer has a linear increase in the execution time (when using default flow control) that matches the increase in the load. Nothing there is concerning, and all-in-all we see what is expected if the load is light. The volume of rows at the end justifies the execution time. It’s a different scenario if we use flow control. The execution time increases significantly in both cases (single worker/multiple workers). In the worst case (eight threads, 50 inserts batch) it becomes four times higher than the same load without flow control. 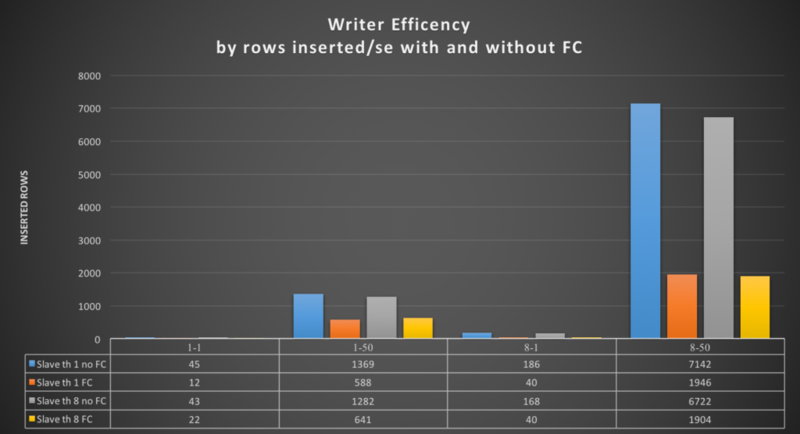 We can see that the Writer with flow control activated inserts less than a third of the rows it processes without flow control. Without flow control, the Writer processes a high volume of rows in a limited amount of time (results from the test of eight workers, eight threads, 50 insert batch). With flow control, the situation changes drastically. The Writer takes a long time processing a significantly smaller number of rows/sec. In short, performance drops significantly. But hey, I’m OK with that if it means having a consistent data-set cross all nodes. In the end, Percona XtraDB Cluster and similar solutions pay a significant performance price match the data-centric principle. Let’s see what happen on the other nodes. When NOT using flow control, the nodes lag behind the writer significantly. Remember that by default flow control in Group Replication is set to 25000 entries (I mean 25K of entries!!!). What happens is that as soon as I put some salt (see load) on the Writer, the slave nodes start to lag. When using the default single worker, that will have a significant impact. While using multiple workers, we see that the lag happens mainly on the node(s) with minimal (10ms) network latency. 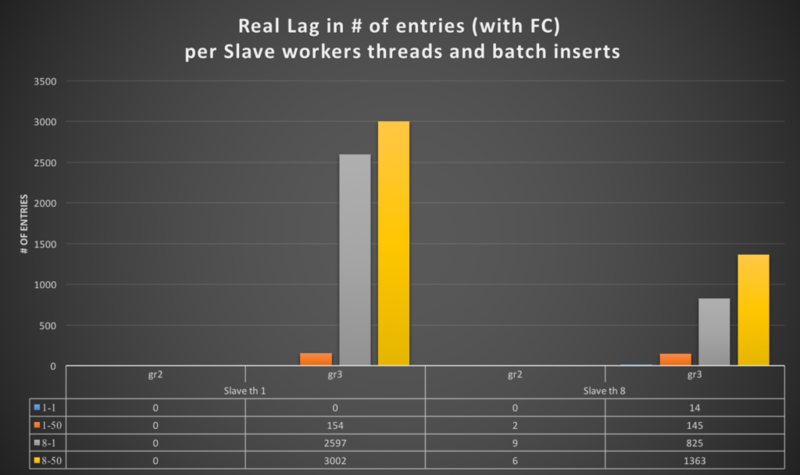 The sad thing is that is not really going down with respect to the single thread worker, indicating that the simple minimal latency of 10ms is enough to affect replication. Unfortunately, this is not the case. 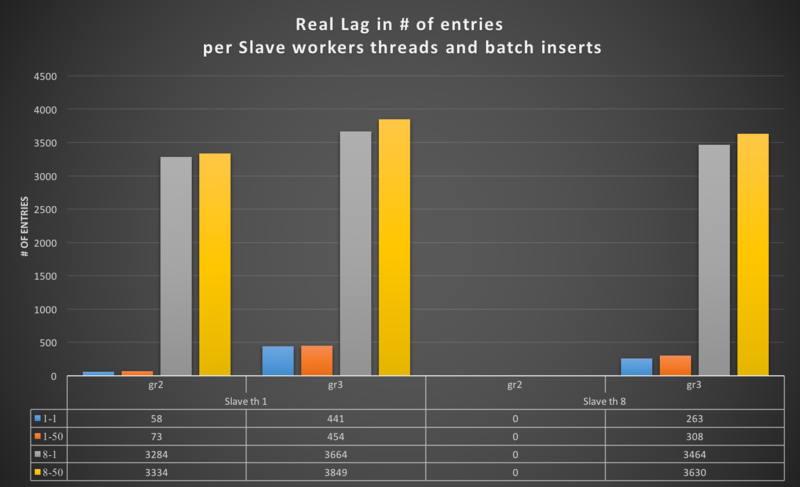 As we can see, the lag of single worker remains high for Gr2 (154 entries). While using multiple workers, the Gr3/4 nodes can perform much better, with significantly less lag (but still high at ~1k entries). It is important to remember that at this time the Writer is processing one-third or less of the rows it is normally able to. It is also important to note that I set 25 to the entry limit in flow control, and the Gr3 (and Gr4) nodes are still lagging more than 1K entries behind. Using the Writer (Master) as a baseline in entry #N, without flow control, the nodes (slaves) using Group Replication start to significantly lag behind the writer (even with a light load). Using flow control, the Writer (Master) diverges less, as expected. If it has a significant drop in performance (one-third or less), the nodes still lag. The worst-case is up to 1363 entries. I need to underline here that we have no further way (that I am aware of, anyway) to tune the lag and prevent it from happening. This means an application cannot transparently split writes/reads and expect consistency. The gap is too high. This graph shows the MySQL queries executed on all the four nodes, in the testing using 8-50 threads-batch and flow control. As you can see, the Gr1 (Writer) is the first one to take off, followed by Gr2. Nodes Gr3 and Gr4 require a bit more, given the binlog transmission (and 10ms delay). Once the data is there, they match (inconsistently) the Gr2 node. This is an effect of flow control asking the Master to slow down. But as previously seen, the nodes will never match the Writer. When the load test is over, the nodes continue to process the queue for additional ~130 seconds. Considering that the whole load takes 420 seconds on the Writer, this means that one-third of the total time on the Writer is spent syncing the slave AFTERWARDS. The above graph shows the same test without flow control. It is interesting to see how the Writer moved above 300 queries/sec, while G2 stayed around 200 and Gr3/4 far below. The Writer was able to process the whole load in ~120 seconds instead 420, while Gr3/4 continue to process the load for an additional ~360 seconds. This means that without flow control set, the nodes lag around 360 seconds behind the Master. With flow control set to 25, they lag 130 seconds. This is a significant gap. Going back to the reason why I was started this PoC, it looks like my application(s) are not a good fit for Group Replication given that I have set Percona XtraDB Cluster to scale out the reads and efficiently move my writer to another when I need to. Group Replication is still based on asynchronous replication (as my colleague Kenny said). It makes sense in many other cases, but it doesn’t compare to solutions based on virtually synchronous replication. It still requires a lot of refinement. On the other hand, for applications that can afford to have a significant gap between writers and readers it is probably fine. But … doesn’t standard replication already cover that? Reviewing the Oracle documentations (https://dev.mysql.com/doc/refman/5.7/en/group-replication-background.html), I can see why Group Replication as part of the InnoDB cluster could help improve high availability when compared to standard replication. But I also think it is important to understand that Group Replication (and derived solutions like InnoDB cluster) are not comparable or a replacement for data-centric solutions as Percona XtraDB Cluster. At least up to now. Is there a minimum MySQL server version for Group Replication? MySQL Group Replication is GA since MySQL Community 5.7.17. This is the lowest version that you should use for the Group Replication feature. Otherwise, you are using a beta version. Since 5.7.17 was the GA release, it’s strongly recommended you use the latest 5.7 minor release. Bugs get fixed and features added in each of the minor releases (as can be seen in the Limitations section in the slide deck). In MySQL 5.6 and earlier versions, Group Replication is not supported. Note that Percona Server for MySQL 5.7.17 and beyond also ships with Group Replication. Can I use Percona XtraDB Cluster with MariaDB v10.2? or must I use Percona Server for MySQL? Percona XtraDB Cluster is Percona Server for MySQL and Percona XtraBackup with the modified Galera library. You cannot run Percona XtraDB Cluster on MariaDB. However, as Percona XtraDB Cluster is open source, it is possible that MariaDB/Codership implements our modifications into their codebase. If Percona XtraDB Cluster does not allow InnoDB tables, how do we typically deal with applications that need to use MyISAM tables? You cannot use MyISAM with Percona XtraDB Cluster, Galera or Group Replication. However, there is experimental MyISAM support in Galera/Percona XtraDB Cluster. But we strongly recommend that you don’t use this in production. It effectively executes all statements in Total Order Isolation, which results in bad performance. What is a typical business use case for the Group Replication? I specifically like the writes order feature. The use cases for Galera and Percona XtraDB Cluster are similar. Where do you run ProxySQL, on a separate server? We are using HAProxy. You can deploy ProxySQL in many different ways. One common method of installation is to run ProxySQL on a separate layer of servers (ensuring there is failover on this layer). Another commonly used method is to run a ProxySQL daemon on every application server. Yes, there are no limitations on virtualization solutions. 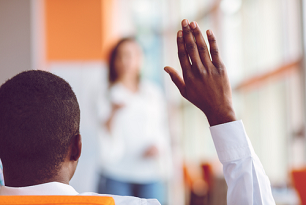 Can you give some examples of an “arbitrator”? 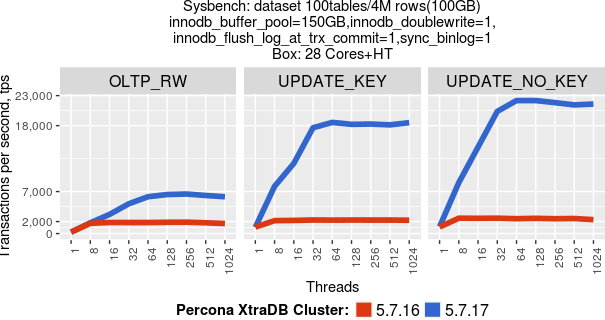 What does Percona XtraDB add to make it more performant than InnoDB? 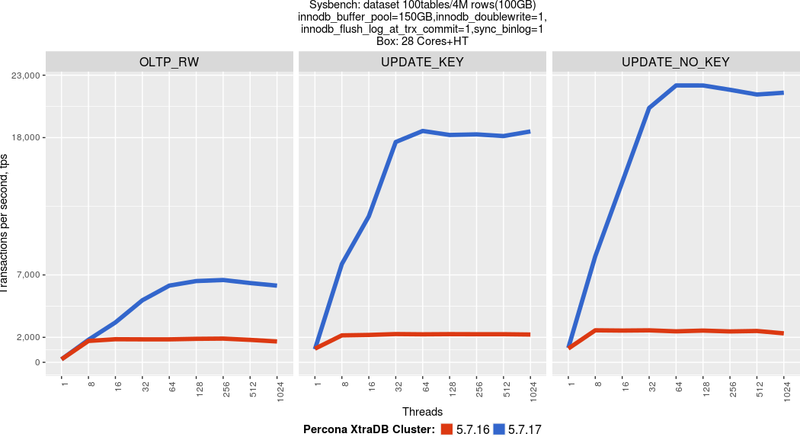 How scalable is Percona XtraDB Cluster storage wise? Do we have any limitations? Storage happens through the storage engine (which is InnoDB). Percona XtraDB Cluster does not have any different limitations than Percona Server for MySQL or MySQL. However, we need to also consider the practical side of things: the larger the cluster gets, the longer certain operations take. For example, when adding a new node to the cluster another node must be the donor and provide all the data. This will take substantially longer with larger datasets. Certain operational aspects might therefore become more complex. Is there any development to add multiple nodes simultaneously? No, at the moment only one node can join the cluster at the same time. Other nodes automatically wait until it is finished before joining. Why does Galera say we cannot use READ COMMITTED isolation for multimaster mode, even though we can start the cluster with READ-COMMITTED? You can use READ-COMMITTED as transaction isolation level. The limitation is that you cannot use SERIALIZABLE: http://galeracluster.com/documentation-webpages/isolationlevels.html. MariaDB 10.2 fixed the check constraints issue, When will Percona fix this issue? There are currently no plans to support CHECK constraints in Percona Server for MySQL (and therefore Percona XtraDB Cluster as well). As Percona Server is effectively a fully backwards-compatible (but modified) MySQL Community Server, CHECK constraints is a feature that normally would be implemented in MySQL Community first. Can you share your performance benchmark git repository (if you have one)? We don’t have a performance benchmark in git repository. You can get detailed information about this benchmark in this blog: Performance improvements in Percona XtraDB Cluster 5.7.17-29.20. On your slide pointing to scalability charts, how many nodes did you run your test against? We used a three-node cluster for this performance benchmark. The product is using Master-Master replication. As such what do you mean when you talk about failover in such configuration? Where do you maintain the cluster state? All technologies automatically maintain the cluster state as you add and remove nodes. What are the network/IP requirements for Proxy SQL? There are no specific requirements. More documentation about ProxySQL can be found here: https://github.com/sysown/proxysql/wiki. 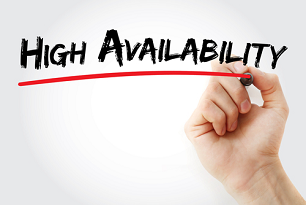 In this blog, we’ll look at different MySQL high availability options. The dynamic MySQL ecosystem is rapidly evolving many technologies built around MySQL. This is especially true for the technologies involved with the high availability (HA) aspects of MySQL. When I joined Percona back in 2009, some of these HA technologies were very popular – but have since been almost forgotten. During the same interval, new technologies have emerged. In order to give some perspective to the reader, and hopefully help to make better choices, I’ll review the MySQL HA landscape as it is in 2017. This review will be in three parts. The first part (this post) will cover the technologies that have been around for a long time: the elders. The second part will focus on the technologies that are very popular today: the adults. Finally, the last part will try to extrapolate which technologies could become popular in the upcoming years: the babies. Quick disclaimer, I am reporting on the technologies I see the most. There are likely many other solutions not covered here, but I can’t talk about technologies I have barely or never used. Apart from the RDS-related technologies, all the technologies covered are open-source. The target audience for this post are people relatively new to MySQL. Let’s review these technologies in the following sections. Replication is simple to setup. There are tons of how-to guides and scripts available to add a slave to a MySQL server. With Amazon RDS, adding a slave is just a few clicks. Slaves allow you to easily scale reads. The slaves are accessible and can be used for reads. This is the most common way of scaling up a MySQL database. Slaves have little impact on the master. 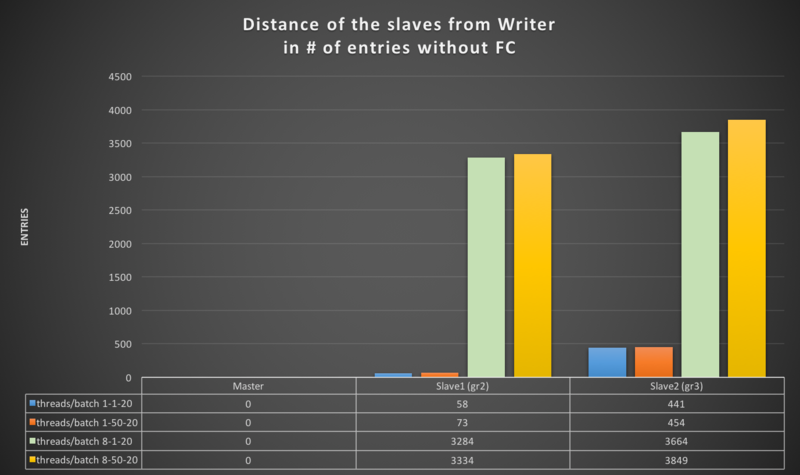 Apart from the added network traffic, the presence of slaves does not impact the master performance significantly. It is well known. No surprises here. Used for failover. Your master died, promote a slave and use it as your new master. Used for backups. You don’t want to overload your master with the backups, run them off a slave. Replication can lag. Replication used to be single-threaded. That means a master with a concurrent load could easily outpace a slave. MySQL 5.6 and MariaDB 10.0 have introduced some parallelism to the slave. Newer versions have further improved to a point where today’s slaves are many times faster than they were. Slaves can diverge. When you modify data on the master, the slave must perform the exact same update. That seems easy, but there are many ways an update can be non-deterministic with statement-based replication. They fixed many issues, and the introduction of row-based replication has been another big step forward. Still, if you write directly to a slave you are asking for trouble. There is a read_only setting, but if the MySQL user has the “SUPER” privilege it is just ignored. That’s why there is now the “super_read_only” setting. Tools like pt-table-checksum and pt-table-sync from the Percona toolkit exist to solve this problem. Replication can impact the master. 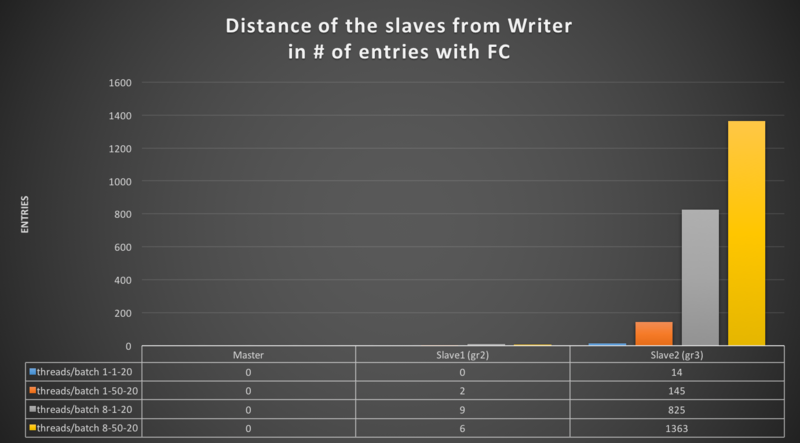 I wrote above that the presence of slaves does not affect the master, but logging changes are more problematic. The most common issue is the InnoDB table-level locking for auto_increment values with statement-based replication. Only one thread can insert new rows at a time. You can avoid this issue with row-based replication and properly configuring settings. Data gets lost. Replication is asynchronous. That means the master will reply “done” after a commit statement even though the slaves have not received updates yet. Some transactions can get lost if the master crashes. Row based replication (since 5.1). The binary internal representation of the rows is sent instead of the SQL statements. This makes replication more robust against slave divergence. Global transaction ID (since 5.6). Transactions are uniquely identified. Replication can be setup without knowing the binlog file and offset. Checksum (since 5.6). Binlog events have checksum values to validate their integrity. Semi-sync replication (since 5.5). An addition to the replication protocol to make the master aware of the reception of events by the slaves. This helps to avoid losing data when a master crashes. Multi-source replication (since 5.7). Allows a slave to have more than one master. Multi-threaded replication (since 5.6). Allows a slave to use multiple threads. This helps to limit the slave lag. MMM. An old Perl tool that used to be quite popular, but had many issues. Now rarely used. MHA. The most popular tool to manage replication. It excels at reconfiguring replication without losing data, and does a decent at handling failover. It is also simple. No wonder it is popular. PRM. A Pacemaker-based solution developed to replace MMM. It’s quite good at failover, but not as good as MHA at reconfiguring replication. It’s also quite complex, thanks to Pacemaker. Not used much. Orchestrator. The new cool tool. It can manage complex topologies and has a nice web-based interface to monitor and control the topology. Back when I was working for MySQL ten years ago, shared storage HA setups were very common. A shared storage HA cluster uses one copy of the database files between one of two servers. One server is active, the other one is passive. In order to be shared, the database files reside on a device that can be mounted by both servers. The device can be physical (like a SAN), or logical (like a Linux DRBD device). On top of that, you need a cluster manager (like Pacemaker) to handle the resources and failovers. This solution is very popular because it allows for failover without losing any transactions. The main drawback of this setup is the need for an idle standby server. The standby server cannot have any other assigned duties since it must always be ready to take over the MySQL server. A shared storage solution is also obviously not resilient to file-level corruption (but that situation is exceptional). Finally, it doesn’t play well with a cloud-based environment. Today, newly-deployed shared storage HA setups are rare. The only ones I encountered over the last year were either old implementations needing support, or new setups that deployed because of existing corporate technology stacks. That should tell you about the technology’s loss of popularity. An NDB Cluster is a distributed clustering solution that has been around for a long time. I personally started working with this technology back in 2008. 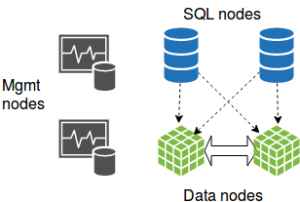 An NDB Cluster has three types of nodes: SQL, management and data. A full HA cluster requires a minimum of four nodes. An NDB Cluster is not a general purpose database due to its distributed nature. For suitable workloads, it is extraordinary good. For unsuitable workloads, it is miserable. A suitable workload for an NDB Cluster contains high concurrency, with a high rate of small primary key oriented transactions. Reaching one million trx/s on an NDB Cluster is nothing exceptional. At the other end of the spectrum, a poor workload for an NDB Cluster is a single-threaded report query on a star-like schema. I have seen some extreme cases where just the network time of a reporting query amounted to more than 20 minutes. 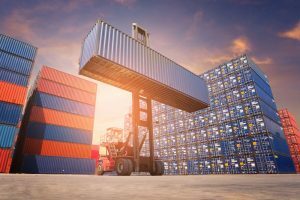 Although NDB Clusters have improved, and are still improving, their usage has been pushed toward niche-type applications. Overall, the technology is losing ground and is now mostly used for Telcos and online gaming applications. 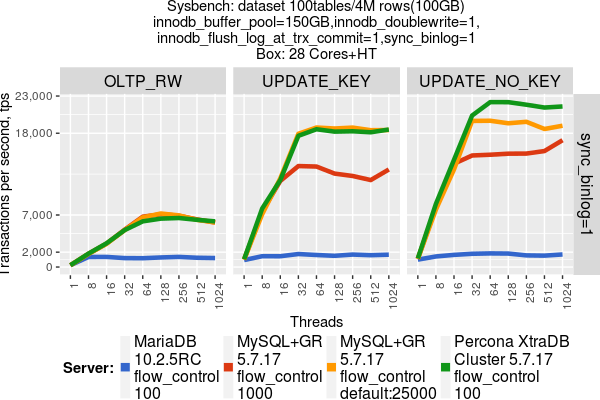 In our latest release of Percona XtraDB Cluster, we’ve introduced major performance improvements to the MySQLwrite-set replication layer. In this post, we want to show what these improvements look like. For the test, we used the sysbench OLTP_RW, UPDATE_KEY and UPDATE_NOKEY workloads with 100 tables, 4mln rows each, which gives about 100GB of datasize. In all the tests we use a three-node setup, connected via a 10GB network, with the sysbench load directed to the one primary node. The main improvements come from concurrent workloads, under multiple threads. The previous chart is for cases using enabled binary logs, but in some situations we will have deployments without binary logs enabled (Percona XtraDB Cluster does not require them). The latest release significantly improves performance for this case as well. Where does Percona XtraDB Cluster place in comparison with similar technologies? 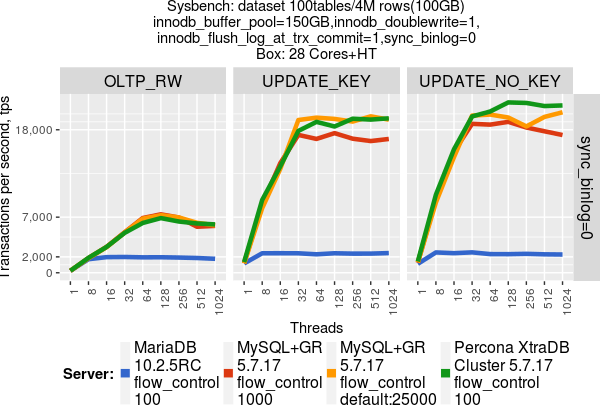 To find out, we’ll compare this release with MySQL 5.7.17 Group Replication and with the recently released MariaDB 10.2.5 RC. For MySQL 5.7.17 Group Replication, I’ve reviewed two cases: “durable” with sync_binlog=1, and “relaxed durability” with sync_binlog=0. Also for MySQL 5.7.17 Group Replication, we want to review two cases with different flow_control settings. The first setting is flow_control=25000 (the default setting). It provides better performance, but with the drawbacks that non-primary nodes will fall behind significantly and MySQL Group Replication does not provide a way to protect from reading stale data. So with a default flow_control=25000, we risk reading very outdated data. We also tested MySQL Group Replication with flow_control=1000 to minimize stale data on non-primary nodes. A note on the Flow Control topic: it is worth mentioning that we also changed the flow_control default for Percona XtraDB Cluster. The default value is 100 instead of 16 (as in version 5.7.16). So there are couple conclusions we can make out of these charts. The reference our benchmark files and config files are here. 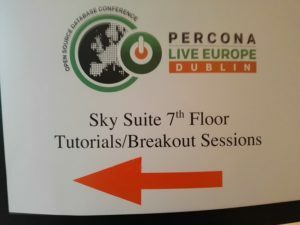 Welcome to another post in the series of Percona Live featured session blogs! In these blogs, we’ll highlight some of the session speakers that will be at this year’s Percona Live conference. We’ll also discuss how these sessions can help you improve your database environment. Make sure to read to the end to get a special Percona Live 2017 registration bonus! In this Percona Live featured session, we’ll meet Luís Soares, Principal Software Engineer at Oracle. His session is The New MySQL Replication Features in MySQL 8 (with fellow presenter Lars Thalmann, Development Director at Oracle). The most popular high availability (HA) techniques deployed are based on making services redundant, in particular by means of replication. This fits quite naturally in the MySQL universe, as MySQL server has provided a mature replication solution for over a decade now. 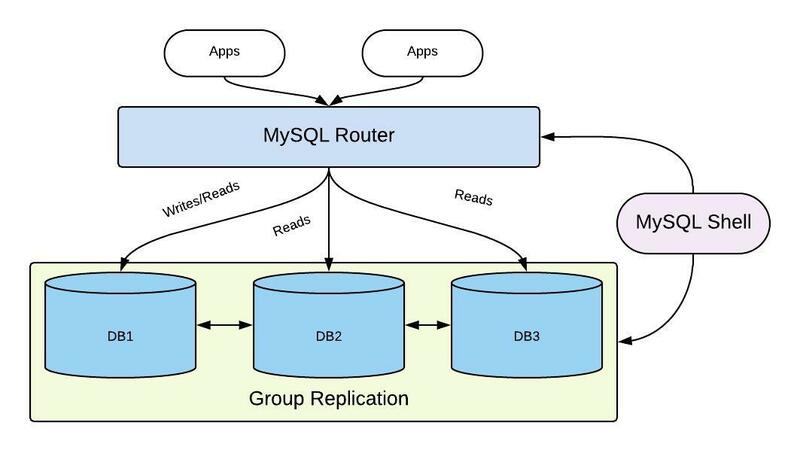 Moreover, the new replication developments (and their roadmap) show that MySQL is also catering for the requirements posed by popular environments such as the cloud. Luís: My background is in distributed systems, particularly in database replication, message passing technologies and fault-tolerance. It all started while I was taking my BSc in computer science. As I finished it, I felt very much drawn towards these subjects. That alone made me enroll in a Master’s course that allowed me to focus almost full time on database replication using group communication technologies. I continued to study this field for years, and further deepened my knowledge on this area. That was great fun and quite a learning experience! Years went by, and eventually I ended up working at MySQL on the replication team. This happened after I came to a MySQL user conference to present some of the work that I was doing at the time. These are very fond memories! But I digress! Back to the point. In general, the thing I love about working on database replication is that I am constantly facing new and interesting problems. Data replication in itself is hard. Add to that the semantics and requirements of a database server, and complexity increases quite a bit. Also, building a generic database replication service that fits in a large set of use cases requires a lot of discipline and careful thinking when designing new features. And let’s not forget the Web itself, which is constantly changing. New technologies come and go at a fast pace. The volume of data that has to be handled, year after year, increases considerably. This poses scalability and integration challenges that need to be addressed. All in all, these are very exciting times to work with high availability, data replication and data integration. Now specifically about MySQL, I love the fact that I work on a popular database technology that embraced replication very early in its life cycle. Replication awareness runs deep in the product and in its ecosystem. Consequently, MySQL has an extensive user base exploring many different use case scenarios around replication. And this is extremely motivating, rewarding and exciting. I can honestly say that my day-to-day work is never boring! Percona: Your talk is called The New MySQL Replication Features in MySQL 8. What are the key replication features in MySQL 8.0, and why are they important? Luís: It was a huge amount of work to get the MySQL Group Replication plugin out with MySQL 5.7.17. Group Replication is a new plugin that gives the user some replication nice properties by resorting to group communication and state machine replication. This makes the system able to protect data against split brain situations, enables fault-tolerance and high availability and provides coordination between servers committing transactions that change the data. In addition to Group Replication, the team has also invested quite a bit on core replication features. Some of these features were already released, and others will be released at some point in time in a MySQL DMR. In the first 8.0 DMR (MySQL 8.0.0) replication has better instrumentation for row-based replication. The user can observe the row-based replication applier progress by querying performance schema tables. There is also an enhanced global transaction identifier. GTIDs history management, as the user can set the variable GTID_PURGED in scenarios other than those where the server has an empty GTID execution history. And the user can now specify the stop condition when starting the relay log applier, even if there are multiple applier threads started. All these features combined are of great help, since they reduce operations overhead through automation, better observability and coordination between servers. Work continues on many fronts: performance, availability, scalability, efficiency and observability. Stay tuned! 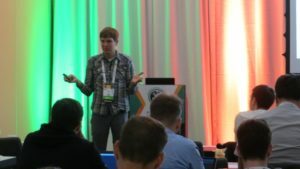 Percona: How do these features make DBAs lives easier? What problems do they solve? Luís: As mentioned above, the features in MySQL 8.0.0 take some of the operations burden from the DBA. Moreover, they allow the user to better observe what is happening inside the replication pipeline. This alone is quite interesting, since DBAs need to make decisions both when designing new deployments and when tackling issues, possibly having to meet very tight deadlines. Simply put, these features will help DBAs to diagnose and fix problems faster. Luís: Our session is primarily about the shiny new replication features already in MySQL 8. This is the first takeaway. To know, first hand, what is in MySQL 8 replication-wise. But there is another takeaway, and quite an interesting one. 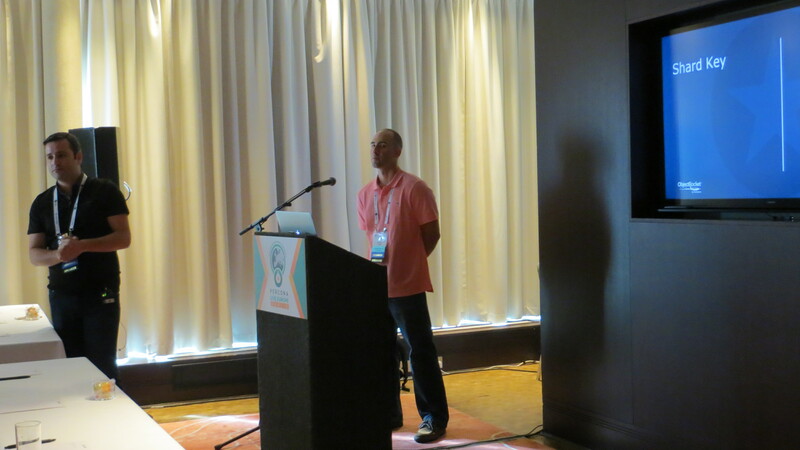 Part of the session is dedicated to presenting the overall ideas around MySQL replication. So attendees will get an overview of the roadmap, and will be able to participate and provide feedback along the way. 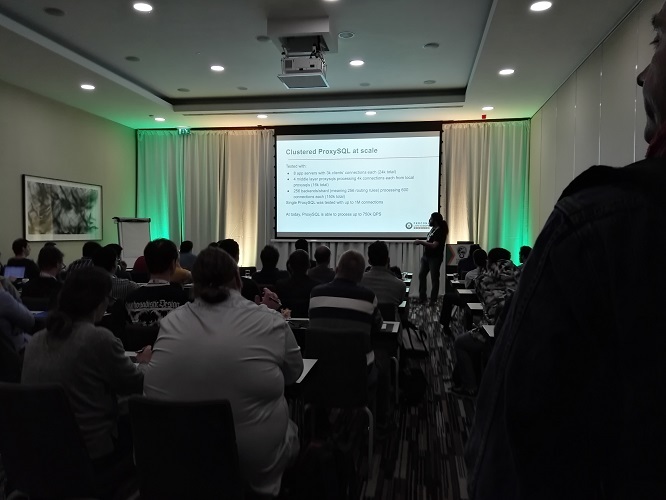 They will learn more about the big picture, and we will bring together some of the hot MySQL technologies that we keep hearing about nowadays: Group Replication, InnoDB Clusters, Multi-Threaded Replication and more! Percona: What are you most looking forward to at Percona Live 2017? 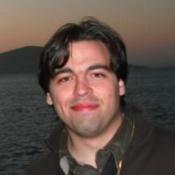 Luís: As a conference participant, I look forward to doing some networking with the vibrant MySQL community. I must say, that I really enjoy engaging in nice technical discussions about my favorite topics: fault-tolerance, replication, dependability and distributed systems overall. The conference gives me a great opportunity to do this. As a MySQL developer, and one that has been developing MySQL replication for quite some time now, I look forward to talking about the recent work that my team has done and getting all the feedback I can. 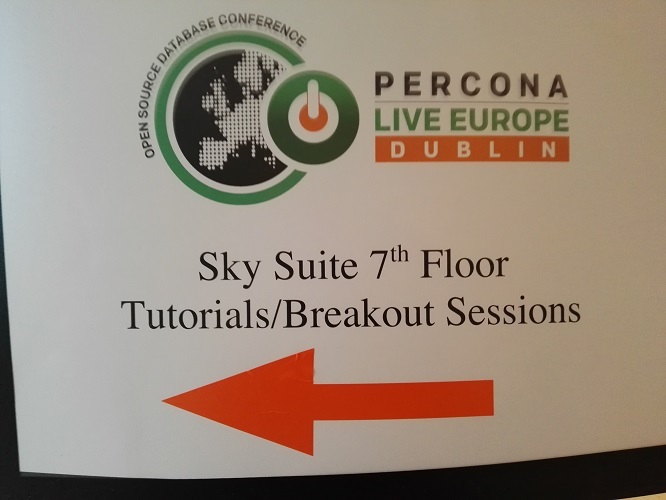 As a bystander, conferences like Percona Live make me realize how much MySQL has grown, and how much it has evolved. Replication, for instance, has had so many interesting features, release after release over the last eight or nine years. The community has embraced and deployed them, often worked/interacted with the developers to improve them by providing feedback, feature requests or contributions. And this means that they are part of the story too! These conferences are always a great learning experience! After spending a week with the MySQL community, I always feel refreshed, energized, extra motivated and with lots of food for thought when I get back home. Register for Percona Live Data Performance Conference 2017, and see Luís present his session on The New MySQL Replication Features in MySQL 8 (with fellow presenter Lars Thalmann, Development Director at Oracle). Use the code FeaturedTalk and receive $100 off the current registration price! Percona Live Data Performance Conference 2017 is the premier open source event for the data performance ecosystem. It is the place to be for the open source community, as well as businesses that thrive in the MySQL, NoSQL, cloud, big data and Internet of Things (IoT) marketplaces. Attendees include DBAs, sysadmins, developers, architects, CTOs, CEOs, and vendors from around the world.